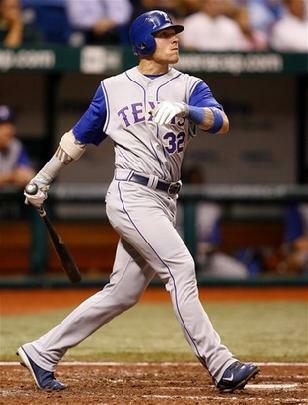 I am very glad that the Texas Rangers pulled out the victory last night over the Cardinals. As a result, I have had this stuck in my head most of the day. Texas Rangers are manly. Whether they be Chuck Norris kicking people in the face or Nolan Ryan hitting people in the head, you don’t want to mess with a Texas Ranger. The video above is when Nolan Ryan hit Robin Ventura with a pitch. 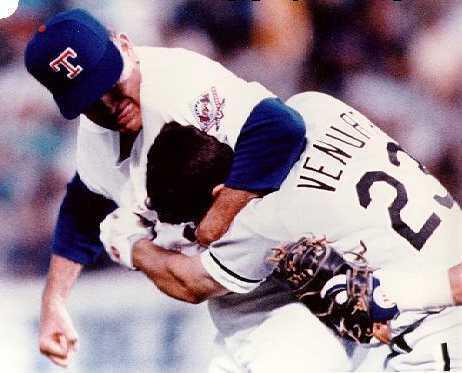 The 26-year-old Robin Ventura charged the mound against the 46-year-old Nolan Ryan. Nolan Ryan promptly put him in a headlock and beat the snot out of him. This same Nolan Ryan is now the president of the Texas Rangers. 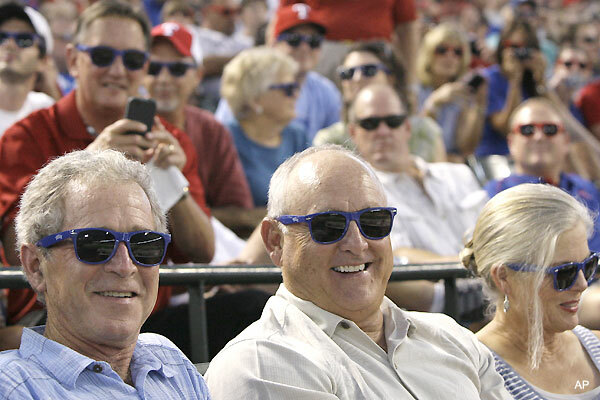 Here is a picture of Nolan Ryan with president George W. Bush. I’m fairly certain that Nolan Ryan could still hold his own in a bench-clearing brawl. I loved watching Nolan Ryan pitch as a kid. He had the best fastball ever, and he was as tough as nails. 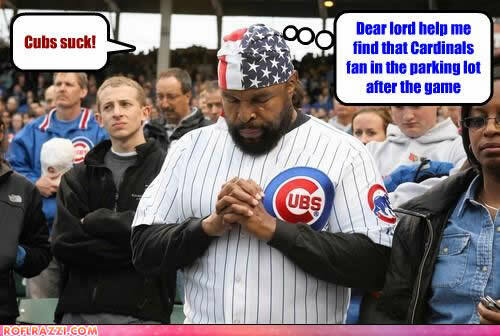 The Cubs/Cardinals rivalry is the most significant rivalry in my sports allegiances. There is no situation in which I would cheer for the Cardinals. It is a friendly rivalry though. Unlike Yankees/Red Sox fans, I can have friendships with many Cardinals fans. There are many Cardinals fans I like, especially my in-laws. But I don’t want them to have the satisfaction of another World Series win before the Cubs get one. Tough-as-nails. Knows the baseball code. Made the Texas Rangers a perennial contender.